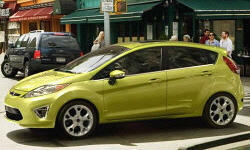 Ford Fiesta Price Or Payments Pros and Cons | Page 1 of 1 | Why Not This Car? What drives people to buy (or not buy) a certain car? TrueDelta's members share Ford Fiesta pros and cons based on their real-world driving experiences. This car has depreciated poorly. If you're OK with a manual transmission, this is a pretty good used car choice. It doesn't look bad, it's comfortable, the handling is great, and the power is what you'd expect for a car in its class. Minis are pricey to begin with. The Clubman is a couple grand pricier still (fancy barn doors aren't free). And the JCW treatment fluffs the sticker another $7,200. Even though it was equipped with hardly any options (and there are many), the tested car listed for $34,645. A base Fiesta ST lists for $22,195. Add $1,995 for heated Recaro seats with cloth centers and leather bolsters. You can also add $795 each for nav and a sunroof, and $595 for either of two ST-uniqe paint colors (green and "molten" orange), but we'll ignore these options here. For the standard amenities and options as compared to Cobalt and several other makes/models Fiesta had the best "bang for the buck" of them all. It is a great value. great price compared to what you get. car could easily cost more and still be sold. A little pricey. Breaks $20K when you price it competitively.